Here’s a new set of printable sachets, along with a great Oatmeal Milk Bath Recipe. Each sachet holds three tablespoons of the Oatmeal Milk Bath Mix, so you can make plenty of sachets for Valentine’s Day or Mother’s Day gifts from one recipe batch. These are great little presents at any time, of course – and what woman do you know who wouldn’t appreciate a little luxury at bath time? I use the Oatmeal Milk Bath mix myself and I love the relaxing bath that results. Here’s a new option to add fragrance: grind up and mix in dried rose petals, lavender, rosemary or other fragrant herbs, along with a few drops of matching essential oils. You could also use essential oil without the herbs, if you prefer not to have the tiny herb fragments floating in your bath. I have tried and like patchouli, lavender, orange and peppermint oils. Readers have asked me where you can buy these – you can find essential oils in health stores, and some craft stores, or check out this page to order Essential Oils from Amazon. Even if you stick to the original recipe, without herbs or oils, the oatmeal milk bath mix will soften bath water and help to gently soften your skin. Cleopatra, renowned for her beauty and charisma, reputedly enjoyed the benefits of milk baths. The milk powder in this recipe makes the bath water silky and cloudy white without the greasiness of bath oils. You probably already have the ingredients in your kitchen pantry, so why not give this recipe a try? Romantic Ladies Sachets: I have redesigned the printable sachets, making them just a little larger than the original set. 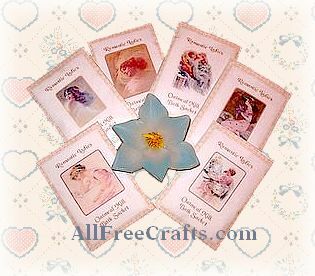 This set of six printable sachets is called “Romantic Ladies” and features fine art images of some very romantic feminine figures. The recipe and instructions for use are printed on the back of the sachet. Pick your sachet pair from the samples at right. 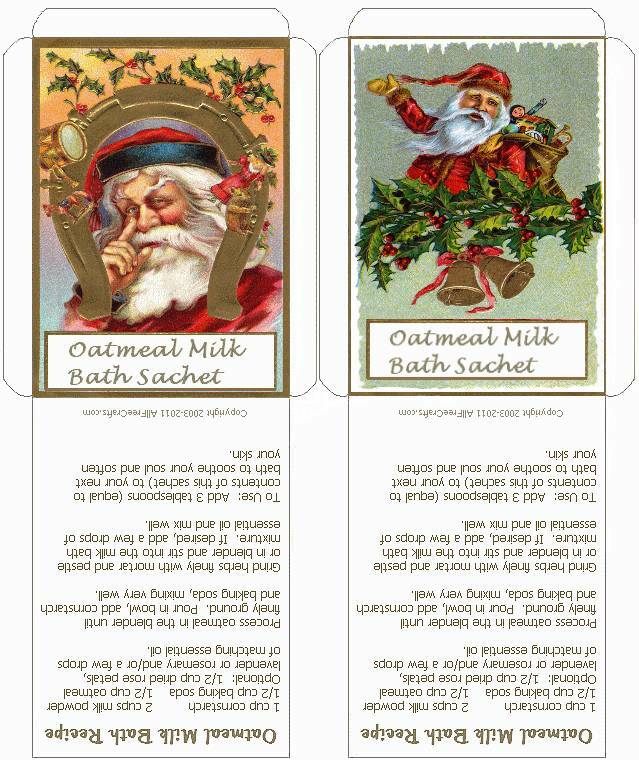 Santa Sachets: For Christmas, I have added two vintage Santa Theme Oatmeal Milk Bath Sachets, for those of you who would like to tuck them into someone’s Christmas stocking, or to give out as a little gift for a friend. The thumbnail for this sachet is shown at left. 1/2 cup dried rose petals, lavender or rosemary, and/or a few drops of matching essential oils. Process oatmeal in the blender until finely ground. Add milk powder and process until well mixed. Pour into a bowl, add corn starch and baking soda, mixing all ingredients very well. Grind herbs finely with a mortar and pestle, or in the blender, and stir into the powdered mixture. If desired, add a few drops of essential oil and mix well. Add three tablespoons (or more, if you like) to your next bath to soothe your soul and soften your skin. Do NOT reprint this project on your blog, group or web site and please do NOT link directly to the urls of my images. I work hard to produce the free crafts on this site; it is only fair that people who want this recipe or the printable sachets get them here, not elsewhere. Please feel free to share a link to this page. Thank you! The sachets (thumbnails shown at right) print two to a page, so just click on the thumbnail of the pair that you would like to print to access the full sized image. Use the “Print” command on your browser, or the Print option available by right clicking on your mouse. Print and cut out sachets. Fold the side tabs and top flap with a sharp crease and then fold the back over the tabs. Unfold the back and apply ample glue to the side tabs. Refold the back and glue in place. Let the glue dry. Fill sachet with three tablespoons (flat, not heaped) of Oatmeal Milk Bath recipe. Use your thumbs to flatten the full sachet a little. This is necessary to avoid excess creases when you seal the sachet. To seal, refold the top flap over the top and refresh the crease with your fingers so that the flap will sit flat against the back. Apply ample glue to the top flap and seal as you would an envelope. You can now distribute the contents of the sachet more equally by gently tapping one or more of the sides of the sachet on a table.